NO - MORE - CLUTTER! Below is an example using the 2014 post count rank, Legendary and the Biollante (Green) theme. I'm indifferent on it, it should probably be done for "Site Staff", "Mod", "Admin" and such - but feel free to comment. Poll votes are important! Please drop a vote! Disclaimer: If a passing vote is achieved, that does not guarantee implementation. Lord SpaceG92, I say yes! Would definitely be better for Probationary members than the eye-searing yellow. I kinda like it. I'm torn! Are these able to replace the text ranks underneath/above our avatars? If so, it'll lean me slightly more towards a "yes". Also, like I said in the Tags topic, an option to disable them would be a great alternative. UltramanGoji wrote: Are these able to replace the text ranks underneath/above our avatars? If so, it'll lean me slightly more towards a "yes". UltramanGoji wrote: Also, like I said in the Tags topic, an option to disable them would be a great alternative. Now this - is another story. By default there is no opt-in or opt-out, I really don't know specifics but for the most part, extensions are "all or nothing" unless specifically coded. SpaceG92 wrote: By default there is no opt-in or opt-out, I really don't know specifics but for the most part, extensions are "all or nothing" unless specifically coded. If this is the case, then I am 100% against it, especially the tags. 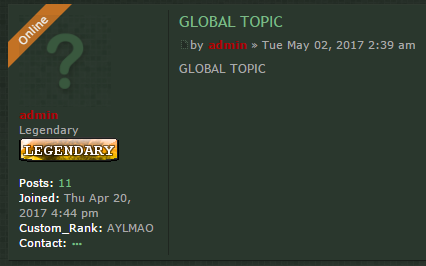 It really clutters the look of the forum and I'd rather not sacrifice that for a potentially better search system or something as superfluous as rank images. Sure, why not? I'm all for it. Only if I can get a tag that says "Film Patrician"
I feel yeah, I'm kinda in the same boat myself. It is a direct mirror of what we have and then some extra ranks I will probably add along. SpaceG92 wrote: It is a direct mirror of what we have and then some extra ranks I will probably add along. Gotcha. Well, aesthetic questions aside, sounds like an interesting idea. I'd be game. Just set them so they look best on the Biollante theme, and we won't have any problems. I can confirm that these image ranks can replace the text based user rank entirely. I am still trying to find a toggle on/off feature, to no avail. Thought i'd drop this here and clear that up real quick. And, as proclaimed, that leans me slightly towards being in favor of it. Would still prefer a toggle but if no solution is found, I can live with it. I thought I responded to this..? Huh, I guess not. Anyway, just to toss in my two cents, I would prefer a system akin to what we had on the old forums where you could change your rank to whatever you pleased, and only the text was affected; as opposed to images. I feel like the images would stand out too much to where they might become a bother on the eye while browsing, though that is just me. ...Unless there were a way to combine the two, such as making a custom image banner that must be a certain size (such as the avatars), and uploading it for use as your rank image.